Tochal Mountain is 3965 meters high and is located in middle of Alburz Mountain Range in Iran adjacent to the capital city Tehran. Mt. Touchal is the most favorite 4000 meter above sea level summit near Teheran city for hiking and trekking tours. Because of its neighborhood to the mega city of Tehran it is very popular not only for hiking & trekking but also a favorite place for rock climbing, on piste ski & snowboard tours. Mount Tochal is an ideal peak for acclimatization and preparation before attempting the giant Damavand. Ascend Mt. Touchal 3965 m and Mt. Damavand 5671 m in one week. This program is recommended for foreign climbers who live around sea level and intend to have a couple of days preparation and acclimatization before trying Mount Damavand. The following itinerary is flexible and it is possible to do some modification to best suit your team, for example no problem to add extra days for bad weather or more acclimatization. Day 1: Fly to Tehran. Transfer to hotel. Overnight hotel in Tehran. 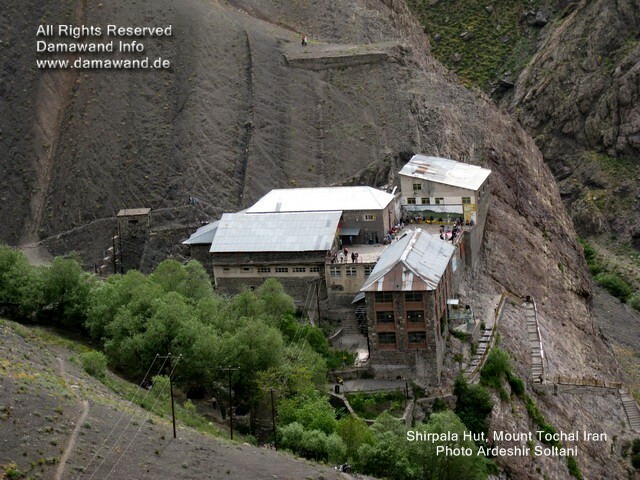 Day 2: Transfer to Sarband Sq., hike to Shirpala Hut (2750 m). O/N Shirpala hut/tent. Day 3: Trek to Mt. Tochal summit (3965 m) return to Tehran. O/N hotel. Day 4: Transfer to Damavand First Campsite (altitude 2270 m). O/N C1 Polour hut/Local House/tent. Day 5: Transfer towards Camp 2 and trek to Camp 3 (altitude 4250 m). O/N Camp 3 Bargah Sevom Hut/tent. Day 6: Climb to Damavand Summit (altitude 5671 m) and back to Camp 3. O/N C3/tent. Day 7: Descent to Camp 2, transfer to Camp 1 and Tehran. O/N hotel in Tehran. Tour ends. Trek Tochal from south route. Mt. Tochal hiking & trekking Tours. Tochal trek tour starting point from Darband. Mt Tochal & Alburz Mountain Range hiking tours. Climbing tour and ski touring Mount Damavand Iran. Touchal and Damavand hiking and trekking tour in one week program.